As much as I love reading military sci-fi and space opera, sometimes I just need a break from the routineness of weighty political dramas and grim space battles. Enter Joe Zieja’s Epic Failure series. 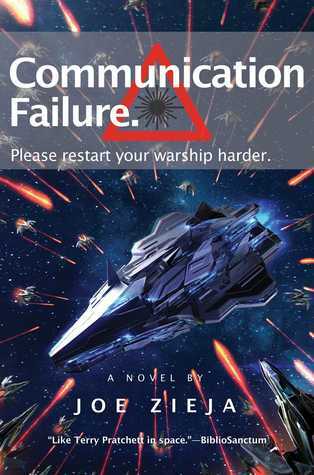 Communication Failure is the second book, following the adventures of former smuggler Captain Rogers who despite his best efforts to get kicked out of the military has found himself promoted to acting admiral of the 331st Meridan fleet. Unfortunately for him, the timing couldn’t have been worse. After two hundred years of peace with their rivals the Thelicosans, the Meridans suddenly receive a transmission from their leader Alandra Keffoule containing the simple yet alarming message: “We’re invading.” Utter chaos and off-the-charts panic thus ensues, as expected from a crew that has forgotten entirely how to fight. Now Rogers is in a bind, unsure of how to get his fleet out of this mess. Finding out that the Thelicosan message had been a miscommunication should have been a relief, but then Keffoule declares her undying love with a proposal for marriage, and to be honest, Rogers would have probably preferred the invasion. Completely out of his depth, our protagonist tries his best to smooth things over with the enemy but somehow only manages to make things worse, underestimating the abilities of his clueless advisors as well as Keffoule’s penchant for kicking those who displease her in the face. Continuing in the same humorous vein as the first book Mechanical Failure, this sequel is once again a scintillatingly funny book, though I was also pleasantly surprised to find that the “goofball” quality of the jokes and situations has been toned down. Considering how the absurd humor and general over-the-top silliness were my main complaints from book one, I found this change to be a welcome improvement in book two. Compared to its predecessor, Communication Failure also strikes a better balance when it comes to showcasing other aspects of the series, exploring multiple POVs and expanding upon the world-building while still injecting a fair amount of quirkiness so that the story still remains very funny. Another improvement was the plot which felt a lot more complex this time around. Much attention to detail was paid in the development of the characters as well as in the highlighting of the cultural differences between the Meridans and the Thelicosans (the latter worships mathematical theory to the point of obsession), helping make the most out of the novel’s theme of “communication failure”. Zieja also took his time to develop conflicts and build tensions, a nice change of pace from the almost episodic format of Mechanical Failure which simply zipped readers from one insane situation to another with no time to even catch a breath. Rogers also becomes a more compelling character when he’s not spending the entire book trying to come up with creative ways to shirk responsibility. That shtick was hilarious was in the first book, but I can’t deny a part of me is glad we’ve moved past that to explore new comic routines. A slightly more serious Rogers of course means an opportunity to develop a fresh repertoire of running jokes, including those related to his complicated love affair with Marine Captain Alsinbury, AKA the Viking. Interactions between the two of them have thus far spawned some truly epic banter with clever double entendres and wordplay. Not to worry, however, if you loved the first book and are concerned that the sequel might have changed too much, because Communication Failure definitely remains true to its roots. Exaggerated slapstick remains a strong component of the humor, and you’ll still get the occasional cringe-worthy pun thrown in with the snappy one-liners. That said, there’s an overall sense that the comedic elements have matured, so personally speaking, Communication Failure worked much better for me than Mechanical Failure as a result. Regardless, it’s always nice when a sequel surpasses the original, and overall I’m quite happy with the way this series is evolving. I love how it doesn’t take itself too seriously while offering up an engaging, satirical tongue-in-cheek riff on the genre. These books are the perfect popcorn entertainment, and I recommend them if you’re looking for some lightness and comedy in your sci-fi. not sure it is for me there but I’m happy to see you had a good time with the story! This sounds hilarious! Like Red Shirts by Scalzi, I love a good humorous scifi! I am checking to this one for sure. Thanks! Yep, especially since I was a bit on the fence with the first book. It was fun, but wasn’t exactly my “type” of humor, if you know what I mean. Now that the goofball humor has been toned down, this one suited me much better! This is a series that I will definitely read at some point (at least I’d like to). I remember your review for No.1 which got me interested and now a really good second instalment. Sounds like a fun series, and I love the titles!